SIENDON NIGERIA, recently introduced its Phoenix P1 dual sim smartphones into the Nigerian telecommunications market, after its remarkable performance in Ghana. Building on its success the dual sim smartphone is not only affordable, it significantly reduces the burden of multiple phone purchases for dual mobile network coverage; fitted with all the smart properties of an “on the go office” for both business and private use. SIENDON NIGERIA, as part of its innovation program created a “SIENDON NIGERIA YOUTH PROGRAM” , which not only generate sales, but also provides an ample opportunity for young focused and enterprising youths between the ages of 18 and 30 in working for themselves; by marketing its dual sim smartphone. Thus removing its dealership participation from the hands of the highest bidders, into the hands of skillful and efficient marketing Marvin’s who stand a chance to be become independent dealers as well as profit bonus sharing stakeholders. SIENDON NIGERIA focuses on emerging markets and supporting initiatives that will further provide access to high quality and affordable telecoms solutions, in order to help facilitate transformation of such markets by using technology based solutions. 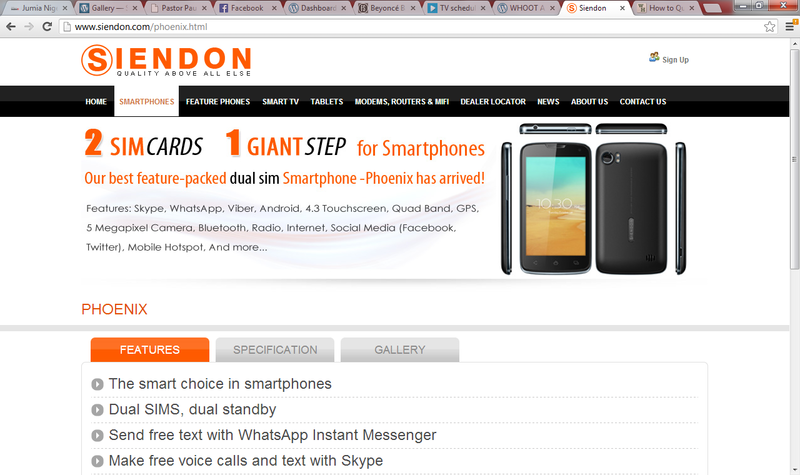 Throughout the month of May, 100 Phoenix P1 dual sim smartphones will be sold at a 10% discount.. This offer is exclusively for the Siendon Nigeria family and we will deliver anywhere in Nigeria free of charge. Firstmonie: Nigerian social media’s fastest selling brand.